When making preparations to move house it’s an ideal opportunity to clear out all of the unnecessary items you’ve been hoarding for years. Not only will this make the move more organised but, as you’ll be taking far less with you in terms of overall weight and the time it takes to load everything up onto the removal van, it could mean considerable financial savings too, not forgetting that your new home will be clutter free when you move in – for a while, at least. In addition to the savings you will make on not having to transport unnecessary items, de-cluttering also serves other useful purposes. It can help you purge yourself both physically and emotionally of things that have no current or future place in your life. Perhaps, you’ve kept old photograph albums of holidays with a long left behind ex-partner from years ago. Perhaps you’ve got boxes of vinyl LPs and you don’t even have a turntable these days. Whatever the reasons behind your de-cluttering, you’ll often find that, if you systematically go through each room in your house on a de-cluttering ‘mission’, you’ll suddenly become aware of so many items that have no intrinsic value to you whatsoever – items that have simply become redundant to your life and which are, effectively, gathering dust so a house move is a great way to clear these things out or, alternatively, for you to make provisions to give them away or to sell some of them so that other people can make use of them. And, if you do the latter, you might even make some extra money to help with the removal costs. Is this really any use to me? Can I fit into it and, if so, could I ever see myself wearing it? Why am I keeping it? Am I only keeping it for sentimental reasons? Obviously, there will be lots of absolute rubbish lying about your house. Old clothes that you’ve long grown out of might be so worn out or so out of style that they’re not going to be use to anybody. But don’t just judge each item by your own standards. Try to think of others who might just have a need for something which you no longer do. In other words, where possible – recycle. This could include gathering together items which you can put on an internet auction site. You could hold a car boot sale, perhaps or there might be many things you can donate to charity shops. 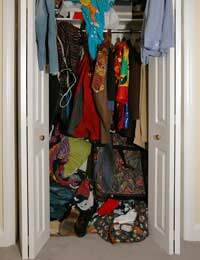 The best way to go about de-cluttering is simply to do it room by room, going through all your drawers, wardrobes and cupboards and also within your shed and garage and gathering everything you no longer have a need for. As you do so, separate those items which are either to be thrown in the bin or potentially recycled. Keep lots of bin bags handy. In other words, by doing that, you’ve made a conscious effort to get rid of things that YOU no longer personally need. You’ll probably be amazed at the amount you’re able to collect and the increased amount of space left as a result. And, that should be enough to leave you without any doubt that you’re doing the right thing because when you look at the space you’ll save a as result, just think – if you were to take all this ‘rubbish’ with you, just how much space that would take up in your new property. You might choose to hire a skip if you have a lot of stuff to get rid of but they aren’t that expensive and, in hiring one, you’re likely to make more of a conscious effort to ditch the sentimentality which will ultimately lighten your load.